Do you remember that Christmas years ago when you got that special toy you had wished for? You ripped away the packaging and couldn't wait to play with it. And for a long time afterwards you were thrilled with it. Remember it? The memory makes you smile, doesn't it? I must admit that today I got as excited as that young boy in me on a Chirstmas morning long ago. I received a package from Hong Kong and this new gizmo called the "Aupener" totally fascinated me. And as I dug deeper into the box, I found more giving me an instant collection of six colors. 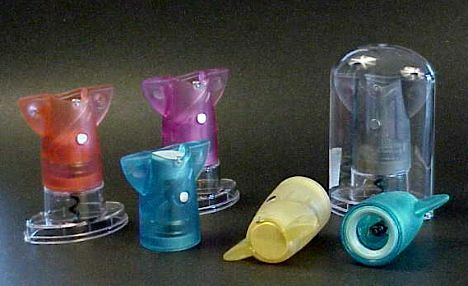 Each was neatly packaged in a plastic dome over a stand for the "Aupener." I examined every bit of this new corkscrew and couldn't wait to put it to use. I grabbed the blue Aupener and went off to the wine cellar. I picked a nice California Zinfandel for an afternoon treat. I cut the foil with the foil cutter built into the contoured top of the Aupener. I place the frame over the bottle neck and started turning the entire Aupener. The worm grabbed the cork and, after a few easy turns, removed it - completely! I pushed the piston out from the top and removed the cork from the worm. Holding the Aupener upside down and using a sharp downward movement retracts the worm. The corkscrew is safely stored and ready to open another bottle. Having done its work, the Aupener could go rest on a counter top - my six different colors look great free standing on the back bar. These little guys are only 2 3/4" tall but they stand out as giants among corkscrews for their efficiency and practicality. I could also place the Aupener back in its stand. I guess I could even put the cover back on to keep it dust free. 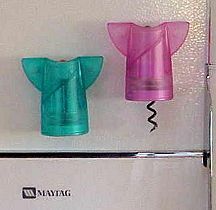 And then there's one more neat thing - it has a built in magnet to store it handily on the refrigerator. The Aupener was invented by wine enthusiast Justin Tseng of Costek Inernational, Hong Kong and is being manufactured in China. It was a Gold Award Winner at the International Institute of Innovators Awards 2000 in London. I poured a glass of Zinfandel and smilingly remembered those Christmas's past and the joys they brought. The Aupener brought that same joy. It will be put to good use for many years to come. This truly is the greatest little corkscrew to come along in many, many years.